All games are played on Sundays with the exception of long weekends and Pride Weekend. Games are played either at 10:00am or at 12:00pm. The league provides equipment needed for game play: team shirt, balls, bats, batting helmets, bases, catcher's equipment, score sheets and first aid kits. Players need to bring their own gloves and other equipment they may need to play. Your registration fees pay for the equipment, so please treat the equipment accordingly! Teams are responsible for setting up the diamonds and transporting equipment to and from nearby storage to the diamonds on game days. The schedule indicates which teams are responsible for storing the equipment at the end of games days and are responsible for taking the equipment to the field at the beginning of game days. Please remember that if your team is responsible for taking the equipment to the field at the beginning of a game day, you are also responsible for setting up the diamond for game play. Games will be called as rain out games if there has been a steady prolonged period of rain or if there is a down-pour or lightning. During game times, umpires have the sole discretion of calling a game as a rain out game. Otherwise, the Collective will make the decision before the start of games. In that event, the information will be posted on the Home Page, and on our Facebook page and Twitter Feed. Your Team Rep will also communicate this information to you. 1. If a player does not agree with the umpire's call, they must state their disagreement to their Team Rep.
2. The Team Rep. may then ask for a time-out to speak to the umpire for clarification of a call involving interpretation of the rules. If the disputed call involves the umpire's judgement, there will be no discussion with the umpire and no protest will be permitted. 3. If the Team Rep. is not satisfied with the umpire's interpretation of the rules, they may indicate to the umpire and the Team Rep. from the opposing team, that the game will be played under protest. The Team Reps. for each team must agree upon this and record the exact situation at the time the protest arises. 4. The Team Rep., who is objecting to the umpire's interpretation, needs to contact the Collective within 24hrs of the end of the game to advise of the protest. 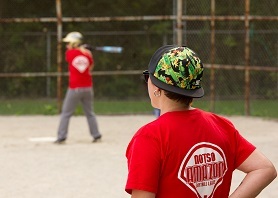 Remember that umpires are there to help us enjoy the sport of softball - please be kind to them! If, after your first scheduled regular season game, you decide that the league is not a good fit for you, you may request a refund. Refunds must be directed to info@notsoamazon.com and must be made within 48hrs of the end of your game. Only then, will you be refunded a pro-rated portion of your registration fee. No refunds will be issued after your first scheduled regular season game.